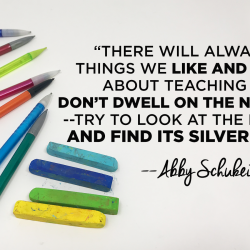 We have a lot of struggles as art teachers, and sometimes it’s best to just talk about how we are feeling. Are we doing enough for our students? Can we really do it all in the art room? The answer is probably not–and that’s okay. We don’t need to feel guilty about it! 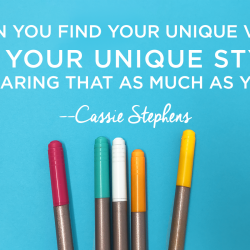 Listen as Cassie talks about all the things she wishes she could do in her art room, why you shouldn’t panic when you feel guilty, and the value of a good support system. Full episode transcript below. Cassie: I’ve recently been hanging out with some art teacher buddies of mine. I took a road trip recently with a bunch of them and had a craft night just this past Friday night with several art teacher friends. These are art teachers, a lot of them I’ve known for years. Some of them are younger teachers, some of them have been teaching since the stone age like myself. We all teach in different districts, but there’s something that we were all talking about and we all have in common. I don’t remember how it came up, but it was just the concern that am I doing enough in my art room? Am I teaching my hardest? Am I able to teach all the topics? I really feel like and when I say I, I’m speaking for all of us and these separate conversations we’ve had because this topic came up several times. I really feel like as an art teacher, we have so many things up in the air that we’re trying to teach, the lesson that’s at hand, contemporary artist, art history, vocabulary, different media, allowing kid’s time to explore on their own independently with all of those things in the air, some of those balls are going to get dropped. With that, if you’re a teacher who’s really passionate about what you’re doing, with that is going to come some serious art teacher guilt. When the topic was brought up, you could just tell that all of us were so relieved that we weren’t the only ones feeling that way. I’m a firm believer that if you feel something, something’s bothering you or itching at you, you’re definitely not alone. It’s happening to other people too and talking about it just makes you feel so much better, just to know that you’re not alone and maybe even hear how other people are trying to resolve that problem, but recently I was asked what is my biggest struggle as an art teacher and it’s that art teacherin guilt. The guilt that I am not doing everything that I should be doing for my students. That guilt unless you’re channeling it to actually find a resolution or let’s be honest, there is no resolution to this, you’re always going to have this guilt because there’s just not enough time in the day to do everything or in an art class to do everything that you can for your students, but let’s talk about getting past that struggle, getting past that guilt. Trying to figure out a solution that might work for you and your art room with your kids. 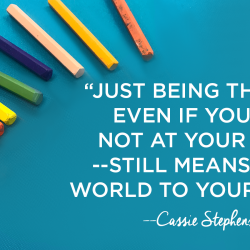 I am Cassie Stephens coming at you hopefully after this podcast a little bit less guilty feeling and this is Everyday Art Room. I made a short list of all of the things that in an ideal, beautiful, unicorn flying rainbows every single day kind of world, I would be able to squeeze into every single magical art class. Here it goes keeping in mind that most of my art classes are 30 minutes, but remember, this is magical rainbow unicorn land. Art history, vocabulary, contemporary artist. Of course, enough time to create, questioning, pre-assessment, post-assessment, exploration of supplies with independent thought, sketchbooks and making an all-relatable time back into my little humans, artists lives. Yeah, like I said, rainbow magical unicorn world. In 30 minutes and even in the classes that I have for an hour, I struggle with so much guilt that I’m not able to put pour, just pour as much as possible into my lessons and if you ever have felt that kind of guilt before about your art teacherin, just know that even people who have been teaching for 20 years who have a podcast, who blog as though they sometimes know what they’re talking about, yeah, I’ll be the first one to tell you. I don’t have a clue what I’m doing. But we all have this struggle. I think coming to that realization is eye-opening and it really helped me to chat with other art teachers to find out, “Oh my goodness, I’m not alone. I knew this already.” But just to hear them say, “Ah, I struggle with that too.” Now of course, if you do have some art teacherin friends out there who have found a way to squeeze more of that and to compress more of that in, then definitely, hit them up. Make sure that you go and observe their classrooms, but today, I just want to share with you my three main tips that will hopefully make it a little bit easier for you to compress things into your lessons and I’m revisiting this. I know I’ve chatted about this a little bit before in previous podcasts, but the reason I’m revisiting this is because I really want to address this in my art room. I really am feeling quite a bit of guilt about this and a lot of times when I’m chatting with you here on Everyday Art Room, it’s because it’s something that’s really fresh on my mind. This is really striking home with me right now. The first thing I want to say to you is this. Number one, don’t panic. 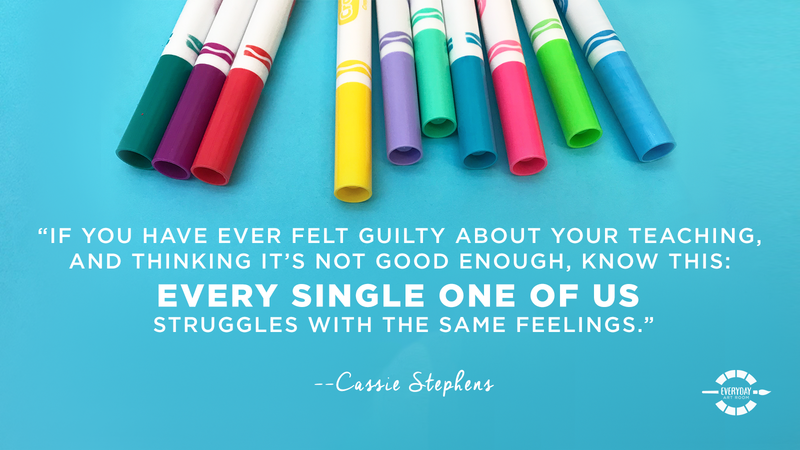 We all experience this, we all have this guilt and we’re all looking to do our best because we know the value of what we teach and we know how special it is to connect with our students. Knowing that we just want to give them our best in everything that we can. Sadly, giving our best is one thing, but giving everything in every single class, it’s just not possible. Let’s be real. It isn’t. It’s exhausting. You might be able to do that one day a week and then the rest of the week you’re like, “Oh my gosh, can I get a snow day up in here just to recover from the fact that I was just turning cartwheels for that class? Just to get them excited to learn.” Take a deep breath, as long as you’re thinking about it, as long as you’re concerned about it and looking for ways to improve, then you are doing your best. For that reason, I’m going to have to make a pie chart. Maybe even a couple of pie charts to understand where I want my student’s time to be spent when they are with me. I drew a circle and I realized right off the bat that I want the majority of my student’s time in my room to be spent creating. That for me, that’s very, very important and I know it probably is for you too. I want my pie chart to essentially look like Pac-Man. With Pac-Man’s body to be creating time. I feel like that’s so vital especially these days when I see my students outside of my classroom, they always have a device in their hands. They’re using it in their classrooms, I’ll run into them at the grocery store and they’ve got their mom’s phone in their hand. They are constantly on some sort of device. For me, I know that that means that they’re not spending as much time as kids may be 10, 15 years ago who when they were, “bored” were taking on a piece of paper and drawing or cutting and creating. I don’t find that kids these days do that as much. For that reason when they’re in my room, I want my pie chart to be Pac-Man sized packed with creating time. What that means is is that a lot of other things on that list that I rattled off are going to be a lot of small slivers on my pie chart if they even make it at all. That’s why I did say, “Make a couple of pie charts.” Every art class that you have with your students doesn’t have to look exactly the same, but I’ll circle back to that in a minute. What did I want the rest of my pie to look like? I want the rest of that pie to involve instructional time. That’s just a given. It has to. When my students walk in, they sit down on the floor. They learn right away what our word of the day is, that’s just something that I’ve established in our routine. I’m able to squeeze that vocabulary in. I also as you guys know because I chat about it all the time, we do a lot of call and response in my room as soon as I’m done giving directions, the kids pair it back to me, the directions. One of the reasons that I love that is is because I’m able to pour so much vocabulary into that little session. If I say, “Today, we are going …” They will repeat me. “Today, we are going to use the primary colors which are …” then we rattle those off. I’m able to squeeze in vocabulary that way too. Like I mentioned, my word of the day, I always tell them when they walk in, our word of the day is texture. Whenever I say texture, you say texture, you already know what to do. For them, they go, “Woop woop.” Whenever they hear me say that word. I’ve got that. I’ve got the creating time down, I’ve got the vocab time down, but where I find that I drop the ball is making sure that my students are learning art history and learning about more contemporary artists and definitely pre-imposed assessment is a struggle for me. Those are pieces of my pie chart that are smaller, that I definitely want to work on making sure I’m at least putting an effort forth. Let’s now circle back to what I was saying about not every pie chart for every class has to look the same. If I am wanting to add more art history to my class and more sketching time, I might have to set aside certain art classes that are dedicated just to that. For example, I started something a while ago that I want to bring back to my room which is called hot minute of history where I spend a couple of minutes introducing my students to art history and then that becomes our theme for our sketchbook time. I once upon a time was really great about getting my students, kicking off every art class that way, but I started having guilt with that because then I noticed my students weren’t having enough creating time and that we weren’t rolling up our sleeves and painting or working with clay because a good portion of our class was dedicated to sketching in our sketchbooks and learning about art history. You see where I’m going here. It’s like a dog chasing its tail. It’s so hard to figure this out and to do the very best that you can, but my new kind of thought is having a couple of different pie charts that will allow me to have, to squeeze these different things in while making sure that nothing falls by the wayside. Having one art class that is more dedicated to sketching time and creating, I definitely want to squeeze that in while other classes are more working on the project at hand. I would definitely recommend sitting down, clean sheet of loose leaf paper, drawing a circle, drawing through your four circles thinking about where do you really want to invest your student’s time. Now, if as you’re coming up with that pie chart and I’m sure you’re similar to me where some of those pieces of your pie are very small. Think about like I said sneaking in vocabulary, sneaking in art history, sneaking in a contemporary artist. Can you do it in such a way that it becomes a part of every class or maybe every other class routine? Perhaps you kick off every class learning about one contemporary artist. Not too long ago on Everyday Art Room, I was chatting with you about how I will often times put a work of art on my television and then as my students trickle in, that’s the first thing they see, that’s the first thing we spend a couple of minutes chatting about in my room. Is that a way that you could have that little sliver of pie be about a contemporary artist or a bit about art history? Sneaking things in any way and anywhere you can I think is what’s going to help us be able to maximize our minutes which is what we were chatting about not too long ago. As I said, we all experience this guilt. We all have these little nagging sensations that am I doing my best? Am I giving my students everything I can? You can either let that really chip away at you or you can really think about a solution. I’ll never forget my very first year teaching, I only taught kindergarten through second grade, but I was very overwhelmed, never having taught that age group before, not even in my student teaching experience. I remember being at home, chatting with my husband Mitch who at that time was my boyfriend who’d also been a teacher for a short while and I was just probably panicking a little bit. I had to come up with a brand new lesson the next day, I didn’t have any clue what I was going to teach those kids. He said, “Cassie, why don’t you just take a mental health day? Why don’t you just take a day where you go a little bit easy on yourself? Give yourself a break.” Now, of course, I would tell myself if it doesn’t matter in five years, it doesn’t matter. Relax. Their education, of course, does matter, but one art class where maybe you open up early finisher centers or maybe they do a draw along video with you or just drawing with you, it’s okay, but really stop, take a deep breath and just maybe change your focus a little bit because when I was sketching out my pie charts, I had another pie chart. I hope I don’t get emotional. I had another pie chart that I came up with. This pie chart is in five years when my students are no longer in my room, what do I want them to remember? Here’s what that pie chart looked like. I wanted them to remember that creating is fun which is why I spend so much time being obnoxious and silly in my room. It’s just my nature, but I have a good time teaching that way, that’s my teaching style. I want them to remember how enjoyable and fun being in art class can be, creating can be fun. I want them to know that unlike Math and unlike Reading and unlike Social Studies and Science, in Art, there is no right or wrong answer that their answer, what they come up with, that’s their own unique mind thinking creatively and expressively. Therefore, that’s the right answer. The most important thing that I want my kids to know is that they’re loved. I love having them in my room, I love teaching them. On that very last pie chart, that was my Pac-Man. That was my biggest piece of the pie. I am so sorry, but I’m being really open with you guys. Teaching is not easy. Teaching from your heart, always being reflective, always pouring as much as you can into it, that’s what’s going to make you a teacher that’s trying their best and one that your kids are going to remember and have a love for learning and hopefully art for the rest of their lives. Before I get into the mailbag, let me just get me a tissue and pull myself together. Tim: Hello, this is Tim Bogatz from Art Ed Radio. First of all, I want you to appreciate what an amazing episode you just listened to. That is some really powerful stuff from Cassie. 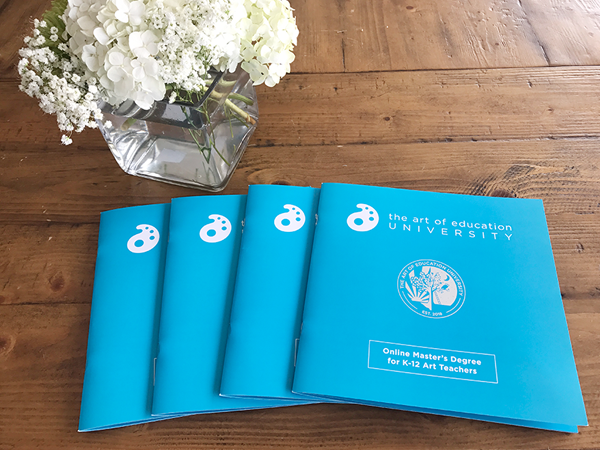 Secondly, I want to give you one last reminder that Saturday is the Art Ed Now Winter Online Conference. A full day of professional development that is taking place with other art teachers just like the ones Cassie has talked about in this episode that care about teaching as much as you do. To me, that is the best part of Art Ed now. It’s that the conference this Saturday gives us all the opportunity to feel like professionals. We talk all the time about how our PD at school is not for us and how there is disrespect in our building and in our district and how we are all alone on the art teacher island, but guess what? Saturday is your chance to change all of that at least for a day. You are with art teachers from around the world that are speaking your language and sharing your concerns and dealing with each other on a professional level. Five hours of amazing presentations and resources and so many things that can help you in your classroom, but today is your last day to sign up. Go to artednow.com to register and we will see you on Saturday. Cassie: Oh Mylanta, somebody needs to get her life together. I’m so sorry, but you all know that we’re just so passionate about what it is we do that we can’t help get emotional and the struggle is so real when it comes to teaching our kids as most as we can, the best that we can, but let’s open this mailbag. This question I actually found on the Art Teachers’ Facebook page. I thought it was such a great question and the question is all about being out sick and getting your lessons prepped for a sub which full disclosure I was chatting about taking a personal day. If I don’t get a snow day up in here, it’s going to happen. I really need a day to just sit in a room and meditate obviously and collect my thoughts because this long stretch from Christmas to spring break, it is no yolk. Okay, question was when you’re going to be out, do you tell your students that you are going to be gone? That’s the first question. Second one is, “Do you continue with projects or do you start new ones?” For me, I almost never tell my students when I’m going to be gone usually because my schedule is so wackadoo that even if I told them, “Hey, next week I’m not going to be here on X, Y, Z day.” I’m not going to remember what classes I will have and what I won’t, which classes to tell that to. I just walk them through some reminders on our behavior, my expectations, you get the idea, but no. I don’t tell my students when I’m going to be gone. I will, however, tell my specials team when I’m going to be gone. We all make a habit of telling each other that the reason behind that is is because my specials team is really good about popping into my room, checking on my sub, making sure to answer any questions that they might have. Those are the people that I do alert, but my kiddos, I don’t. The second question is, “Do you continue projects?” Heck to the no. I don’t do any of those projects for my poor sub because usually, we’re doing things like painting or weaving or working with clay and the subs that come to my room usually don’t have an art background. Imagine going into the sub in a room and you’re expected to teach, I don’t know, weaving and you’ve never done that before. If the kids are still in the process of learning, it could end up being a complete disaster. I was going to say unless it’s a low mess whatever, no, there isn’t really a lot of low mess stuff that we do in my room when I’m there. When it comes to the sub being there, that we always start a brand new project. I have a ton of those sub video lessons on my YouTube channel and I share them so that you can use them if you ever want or need to. In fact, I recently posted one inspired by one of my favorite contemporary artist Chris Uphues, but the projects that we do are almost always pencil, sharpy, color pencil, crayons sometimes. I’m not a big crayon person, markers, that kind of thing. Then it’s always a project that when I come back, we pick it up where the sub left off. Then from there, we can add a little bit of paint to it or whatever, but I do and I love doing that because then when I come back especially if I’ve been out for a couple of days, I’m not coming back and rushing around like a crazy person, getting all of the supplies ready from where … From previous times from before when I was gone, we just pick up where the sub left off, finish that and then go back to our regular lessons as scheduled if that makes sense, but I thought that was such a great question and like I said, if I did say, I do have an entire podcast episode all about how I set up and prep for a sub. You might want to check that out. If you have a question for me, feel free to send it my way. You can find me at the Everyday Art Room at the artofed.com. After all of that pie chart talk, are you guys not craving some pie? Apple with a little whipped cream. I don’t know. Maybe it’s just me wanting to eat my feelings because obviously, I’m getting a little emotional, but I know you guys understand. The day that we all stop being passionate and emotional and get teary-eyed about what it is we do, that’s the day we need to step aside and let somebody else who feels that way take the wheel. I hope you guys have an awesome week. Just know that while you’re in your room teaching, struggling to find the answers, I’m doing the very same thing in mind with hundreds of other art teachers across the world I’m willing to guess. Have an awesome week you guys.